After some major flight delays, getting rerouted several times due to weather, and missing my last connection, I managed to finagle my way onto a final flight and make it safely to Santa Barbara last night. Needless to say, traveling for some eighteen-odd hours can be exhausting. Between the stress of flight timing, generally subpar dining options, and dehydrating, recirculating air, a full day of flying doesn’t often leave one feeling their best. Cue this light and refreshing pasta salad. 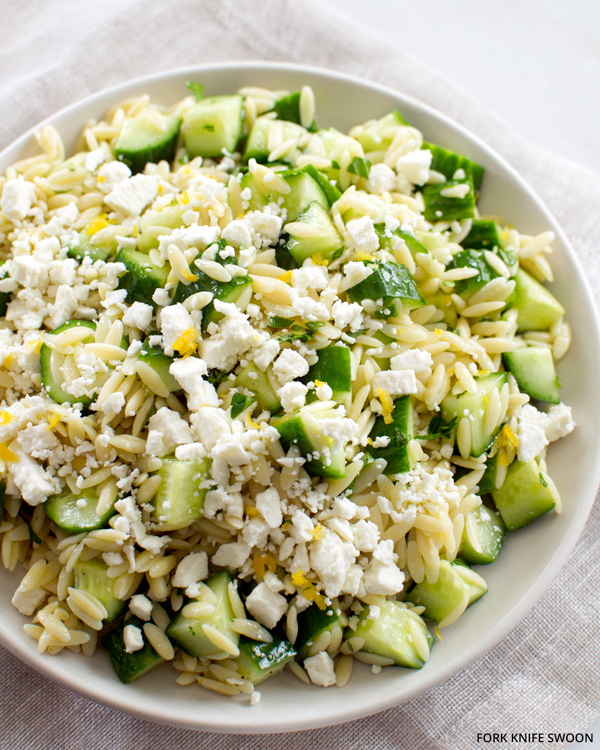 Bright, lemony orzo pasta is tossed with fresh cucumber, herbs and salty feta for an easy summer salad that makes a great barbecue or pot-luck side dish. This is what I should have brought with me on the plane, instead of consuming the limp, tasteless airport salad and bag of peanut butter m&m’s that sufficed for sustenance en route yesterday. This healthy and flavorful pasta dish would be equally delicious alongside some grilled burgers or fish this Memorial Day weekend, or as a mid-flight snack on my return trip! Bring a large pot of salted water to a boil. Cook the orzo al dente according to package directions (about 9 minutes). 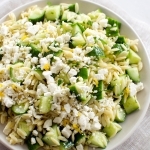 Drain the pasta, let cool for a couple of minutes, and toss with the olive oil, lemon juice and zest, cucumber, herbs and feta. Season with salt and pepper, to taste. Serve chilled or at room-temperature. Can be made up to a day in advance and kept in the refrigerator. Awesome Awesome Awesome Recipe!!! I have made it probably 20 times with different variations depending on what I have on hand. Sometimes I throw in tiny diced zuchinni to bulk up the veggies (it is virtually flavorless) either raw or I drop it in the cooking pasta water for the last minute to soften it a tad. I have used basil when I have no mint/parsley, throw in cherry tomatoes sometimes, with or without feta and I also cook the orzo in chicken broth. It adds so much flavor for me. Sometimes we just eat this for dinner with a grilled chicken breast. Wonderful recipe thanks so much! Just made this tonight for a family barbecue and just love it! Very light and refreshing. This will be a keeper for sure. Thanks for sharing! Thanks, Kristine!! So happy to hear that!